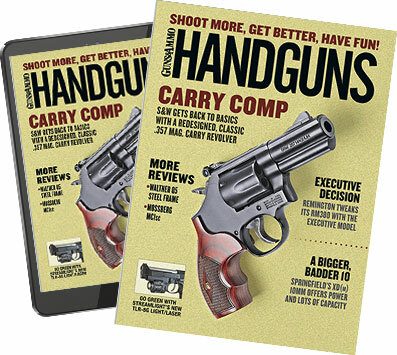 J. Scott Rupp, editor in chief of Handguns magazine and executive producer for Handguns TV, used a Thompson/Center Encore Pro Hunter on a number of hunts and found it to be an accurate and versatile gun. 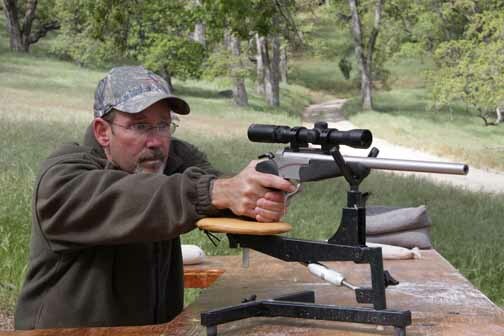 On three recent hunts for Handguns TV I've been shooting a Thompson/Center Encore Pro Hunter. It's a single-shot break-open design that allows you to make the gun into a handgun, rifle, shotgun or even a muzzleloader. In fact, in preparation for the TV hunts, all I had to do was give T/C a call and request a barrel, fore-end and grip for the Pro Hunter I already had-—which I had set up as a rifle in .280 Remington. How does that work? Simple. All you have to do is remove the two fore-end screws, pop off the fore-end, then drive out the large hinge pin. Off comes the barrel, along with the scope and scope mount. To change the grip, remove the grip cap screws then get in there with an Allen wrench to remove the bolt holding the grip in place. One of the beauties of the system is that whether you're going from rifle to handgun or from one handgun chambering to another, your sighting setup, whether scope or iron sights, maintains its zero. Like I said, it's a break-open design. To open the action you just pull back on the trigger guard lever to break it open. It has an extractor but no ejector, so you have to remove cartridges or spent cases by hand. One feature that the Pro Hunter has that standard Encores do not is the Swing Hammer. By loosening the hammer's screw you can change the hammer to a left or right offset for use with a scope or place it in the center for iron sight use. The Pro Hunter has a comfy grip and fore-end, and that does a lot to tame recoil in some of the more powerful chamberings. The trigger breaks at 6-1/2 pounds, which is fairly heavy for a hunting trigger, but there's almost no creep. With a Burris 1-1/2-4X pistol scope aboard it weighs about 5-1/2 pounds. There's a lot of metal surrounding the cartridge, and this strength is what allows the Pro Hunter to chamber bottleneck rifle cartridges in a pistol configuration. The one I've been shooting is the relatively new 6.5 Creedmoor. It was developed by Hornady a few years ago as a competition cartridge, but it's moved into the hunting field and has become one of my favorites. This barrel came out of T/C's Custom Shop, and the company is not sure what the future is for this particular chambering, but that didn't stop me from doing a little begging and pleading to let me borrow it for the hunts. The 6.5 Creedmoor is based on the .30 TC case, and in the Superformance loads I've been using it'll push a 120-grain GMX or 129-grain SST bullet to about 3,000 feet per second. Now in this 15-inch handgun barrel you're obviously going to lose some of the velocity you would get in a rifle barrel. I chronographed the GMX load at 2,740 feet per second out of the Encore. That's a ton more velocity than you're going to get out of any straight-walled revolver case, and that means a much flatter trajectory. I zeroed the Pro Hunter for 100 yards, which is as far as I'm comfortable shooting on most game animals, but if I wanted to stretch it out, I'd be only about two inches low at 150 yards and only about five inches low at 200. Try that with a .44 Magnum. The Encore Pro Hunter pistol sells for about $750. That's a pretty good deal when you consider you can switch back and forth between about a dozen calibers in the pistol configuration and also turn it into a rifle—or a muzzleloader or even a shotgun. It's the ultimate in versatile hunting guns.